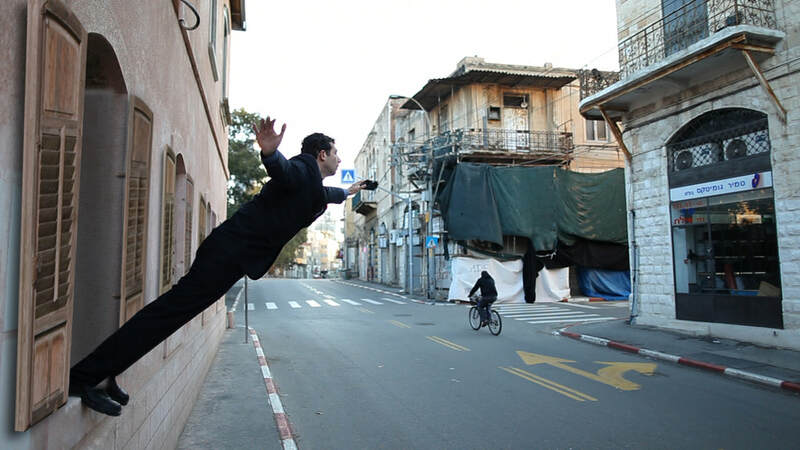 The video leap of faith starts with a shot of the artist wearing a suit, standing on the window’s edge, getting ready to make the leap of his life to the wide open space. The artist is hesitating, having difficulties in creating a momentum to jump, but eventually jumps. Surprisingly he freezes horizontally, while his feet touch the window’s edge - homage to the known work of Yves Klein "Artist jumps into the void (1959). When the shot opens up it appears that the window from which the artist was afraid to jump is just a few feet above ground. The camera stands still presenting a grotesque and surreal image of the artist hanging between heaven and earth. In the video the artist chooses to use the window in an unusual way, in order to achieve his goal. The artist’s fear, arising from a possible failure, leads to hesitation in accomplishing his goal. The failure, however, is not so painful as the window is just a few feet away from the ground. The work criticizes two characteristics of the human nature. One is the fear form failure and social criticism that can paralyze and prevent breaching borders, while in many cases, like in the work, such fears are only in the person’s (the artist) eyes, as the fall is not so painful. The second is wining glory at any price, where like in the work - the act seems heroic, in the artist’s perception, while it seems grotesque in for the viewers.